It would be appropriate to start off with a confession... I started this challenge using a free coloring page off the internet as my "string". 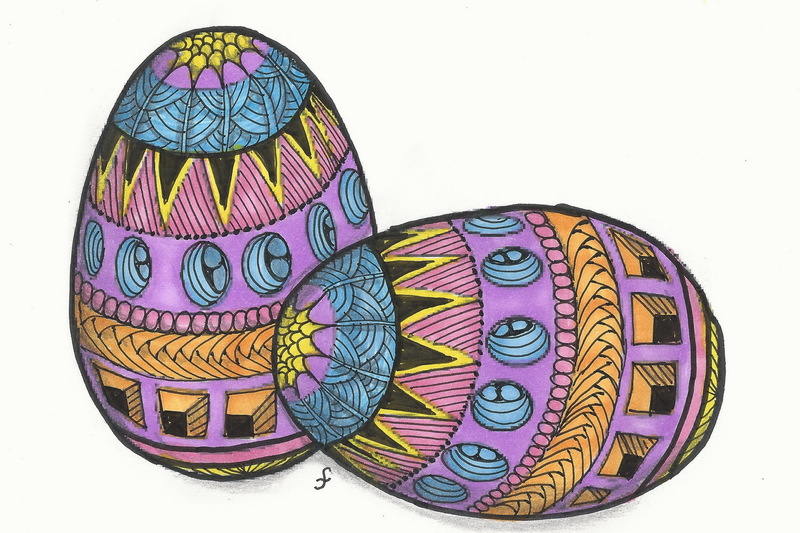 Running low on time and inspiration, I allowed myself this little short cut, it was fun making the two eggs just alike when I added the tangles to them. Actually coloring pages are a great resource for doing representational strings. I have used them for doing classes with young children and found they offer an added dimension of interest. I hope you all have a very Happy Easter. Love your twins, great patterns and execution! 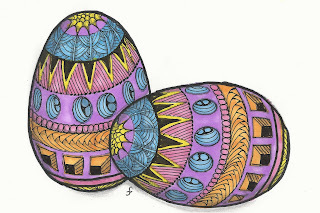 What lovely eggs! And the colors are wonderful! Sometimes we need shortcuts to keep the stresses away! Wonderful colours! Wow I love the Easter eggs. They're very detailed and I love the bright colors.